The surprising "Udderbelly" houses Edinburgh Fringe Festival events. Photo courtesy of <http://www.underbelly.co.uk/main.php>. Used with permission. In the fourteenth century, a precursor to the University of Oxford's Bodleian Library held a small collection of books that were available for viewing, although the books were chained in place in order to keep them safe. Back then, the curators of those "chained books" might have wondered how to get the word out about the collection. 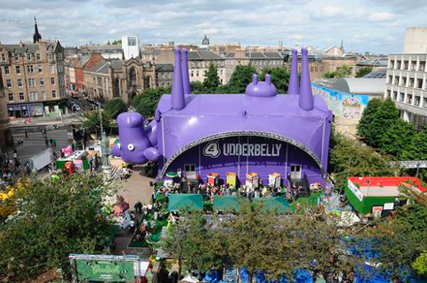 Apparently, they did not have a giant, upside-down, purple "Udderbelly" cow tent to draw attention to their scholarly resources, but in 2009, the unlikely emblem of the "udderbelly" helped to promote Edinburgh Fringe Festival events, which now include the Repository Fringe Festival (RFF). Sheila Cannell, Head of Edinburgh University Library Services, opened RFF  which was sponsored by the Joint Information Systems Committee (JISC) and was hosted by Edinburgh University's school of Informatics  by suggesting that attendees think of "Udderbelly" as a reminder to be creative in coming up with solutions for repository problems. Over the course of the past year, much progress has been made in repository deployment as many new collections of digital treasures have come online. The libraries and institutions deploying these collections, however, need to continue to encourage use of the collections in order to justify the human and financial resources needed to maintain them. Yet, in spite of the rough edges around software and deployment and marketing strategies, a body of real-world experience now exists with regard to institutional repositories. Where and how to spread functions over a networked information infrastructure was therefore a key part of RFF discussions. RFF was held from 30 - 31 July and was attended by repository managers and developers from the UK and beyond. The organization of RFF was informal and the agenda was definitely "unconference" style. Presentations focusing on hybrid paper/digital deposit repository systems and streamlined scholarly workflows were presented by attendees who had self-selected to be part of the RFF program. The goal of the meeting was to encourage discussion of emerging repository issues and to come up with perhaps "fringy" ideas about how to solve problems. From opening keynote speakers Sally Rumsey and Ben O'Steen, Oxford University, to closing remarks by Clifford Lynch, Coalition for Networked Information (CNI), views were offered with a focus on new ways of juxtaposing aspects of information management to create a global landscape of knowledge and information. Topics centered on combinations of technology, policy development, best practices, and innovation. Sally Rumsey and Ben O'Steen set the stage by painting a picture of tradition and innovation as linked concepts at Oxford Libraries. Rumsey used Clifford Lynch's notion of what a repository is  a set of services, integrated with surrounding systems  as she traced the history of the Bodleian Library as it evolved from 1620 to today. She noted that, currently, the Bodleian Library averages 1.6 million visitors per year. As the Library evolved, its catalog became a file system with content directly related to records, collection policies were debated and enacted, and items were required to be "findable," Over time, as scholars contributed their collections, space to house the Library's resources became an issue, and use was controlled to serve a wide scholarly community. At every stage of the Bodleian Library's development, Oxford changed practices and policies, and improved  first analog and later digital  technologies in response to changes in the world beyond the Library. Realization is still a catalyst for change. As a concept, Rumsey also pointed out that at institutions like Oxford almost never establish institutional repositories (IRs) that exist as stand-alone silos, but that are components of larger library service platforms. In his keynote, Ben O'Steen said that the most useful metaphor for understanding the concept of a repository is the Internet itself. It is distributed across a number of nodes; service and storage are separate and yet available to be mashed up in various ways; there are numerous ways to search content; and any service or storage can disappear, be added or upgraded without affecting the other systems unduly. He challenged attendees to think about how to make IRs behave more like the Web. Both Rumsey and O'Steen concluded their talks by highlighting policies and practices that would lead to the development of repositories in service to a concept of a global repository. Rumsey noted that policies are key drivers in determining repository features and functions. O'Steen believes that we have already "reinvented too many wheels" when it comes to developing repository services. He stated the Web exists and it works, and that by using de facto standards such as http for file transfer, we can take better advantage of the Web's ubiquitous framework. In the closing RFF keynote, Clifford Lynch pointed out several interesting issues  data replication and abstraction; inclusion of software in repositories; name and authority control and spanning services  that attendees might consider working on. From his vantage point as observer, he suggested that we move away from the notion of trying to preserve things forever. He suggested that incremental, structured assessments might be a better way forward than open-ended preservation commitments, and perhaps, for now, the aim should be simply to preserve digital objects for the next 20 years with subsequent assessments instead of aiming to preserve them forever. Lynch also put forth two kinds of "fringy" propositions: It may be that faculty will only interact with a repository on an occasional basis. Institutional programs that recognize faculty at the end of their careers and collect their materials ensure that distinguished scholars' works are not lost, and thereby will create a legacy of contributions on behalf of scholars. These types of initiatives provide real service to universities and solve a scholarly dilemma for many institutions. He also suggested that institutional repositories are set to move beyond higher education, non-profit and research centers. Lynch believes that we are going to see more public versions of repositories in local historical societies and other types of non-profit organizations. Therefore, we need to think about providing non-vetted repositories for everyday deposits. This would result in a large body of knowledge going forward. The Repository Fringe Festival will more than likely make an appearance next year. Stay tuned to find out more at <http://wiki.repositoryfringe.org/index.php>. The author thanks Sally Rumsey, ORA Service & Development Manager SERS, Oxford University Library Services and Elin Strangeland, DSpace@Cambridge Repository Manager, Cambridge University Library, for contributing notes and references for this report. Repository Fringe Wiki: <http://wiki.repositoryfringe.org/index.php>. The official RFF wiki includes program session information and lots more. Repository Fringe Challenge 2009: "Design a repository focused/enhancement service to a researcher/academic/teacher that they would feel is intuitively useful to them personally." Results to be announced. See <http://wiki.repositoryfringe.org/index.php/The_Challenge>. DISC UK Datashare Blog: <http://jisc-datashare.blogspot.com>. This is the record of the live blogging from RFF. RFF Web site: <http://www.repositoryfringe.org>. Contains links to video recordings of RFF sessions.